I don't know about you, but I live in a small town and the paleo diet isn't exactly popular here. I have a few friends and acquaintances who dabble in paleo 80/20 style, but I'm the only one who follows a healing diet 100% of the time. So, like many of you, my paleo support network is online, made up of bloggers, readers, and a global community of people walking the same path as me. I don't think I could have done this alone! Whether it's sharing recipes, empathy, humor or encouragement, we lift each other up and keep each other going. This is where the internet is an enormous blessing. Yet there's something special about face-to-face friendships. 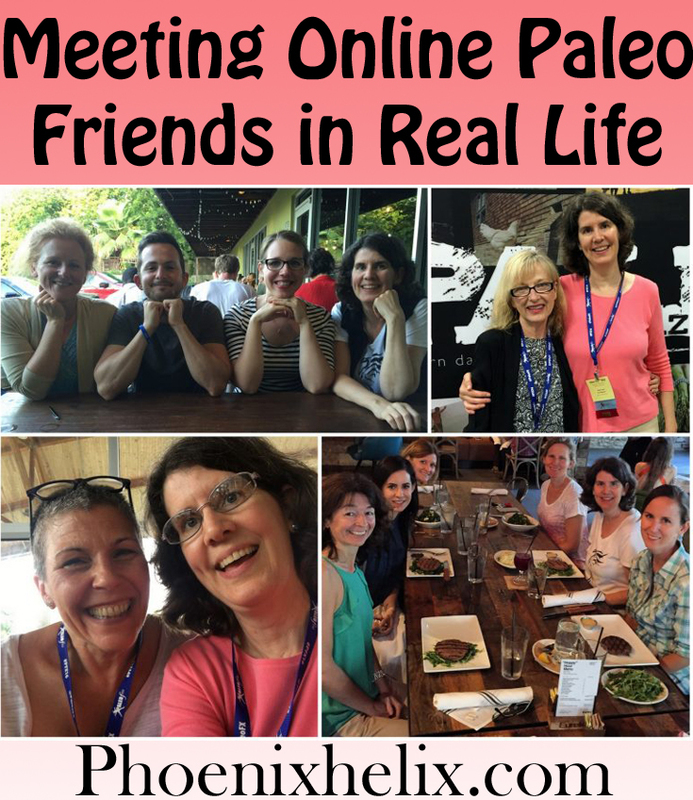 This year, I got to meet some of my online paleo friends in person. I wondered if I really knew them through our years of internet conversation. You hear so much about people putting their fantasy selves online. However, I don't think that happens as often in the autoimmune community, at least not in my circle. None of us are interested in sugarcoating the journey. Relationships only deepen when we keep it real. When I met them in person, I felt like I'd known them for years (which I had), but it went from 2-D to 3-D. In May, I went to PaleoFx for the first time. 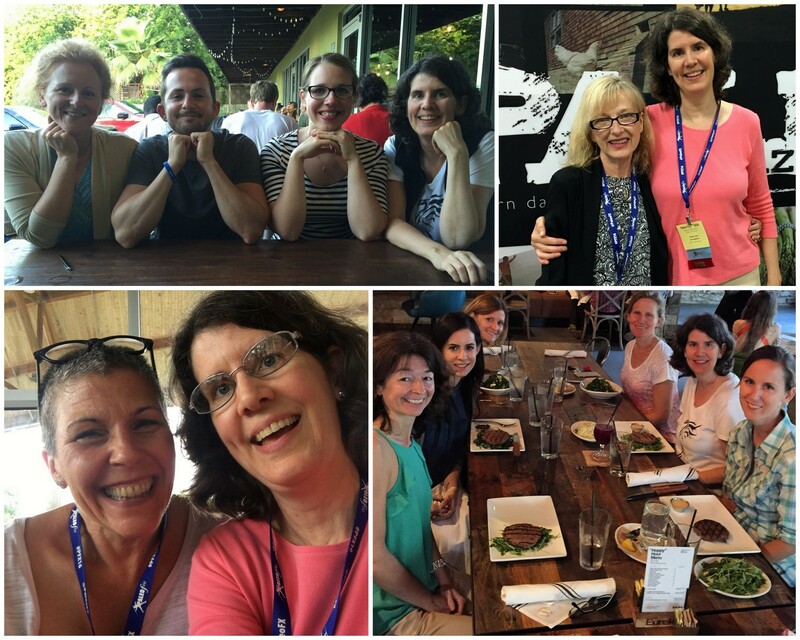 First a confession: it was sensory overload for an introvert like me, but the 1:1 connections were the highlights of my trip and made it all worthwhile. Blogger Buddies: In the top left photo above, that's Sophie from A Squirrel in the Kitchen, Rory from The Paleo PI, Laura from Sweet Treats, and Me! We shared lunches and dinners while attending the conference, navigating the local restaurants with AIP expertise. While we did talk about blogging and paleo, we also talked about our families, childhoods, favorite places and memorable experiences. We had the luxury of time to have open-ended conversations that didn't need to be typed on a computer screen. It was lovely! I wish I could share meals with all of my blogger buddies. If only teleportation was real! Central TX AIP Meetup Group: In the bottom right photo above, I shared a wonderful 3-hour meal with some of the local Austin AIP tribe. Each one of these women had a powerful story of healing and resilience, and it was inspiring to spend time together. These groups exist across the country, and I'll tell you how to find yours at the end of this article. Quick Connections: In the bottom left photo above, That's V. Capaldi aka the Paleo Boss Lady. 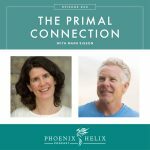 She's a Wahls Warrior whom I've interviewed twice on my podcast, and she is currently on a year-long road trip across the country, spreading the message of conscious living and healing foods. She is a bundle of energy, and it was so fun to chat over lunch one day. PaleoFx is full of opportunities for quick connections like this. I also had the pleasure of meeting Sarah Ballantyne, Melissa Hartwig, Chris Kresser, Michael Ruscio, and many more. Don't be afraid to walk right up to people you recognize. Everyone at PaleoFx is looking for this type of 1:1 connection. We all spend too much time behind our screens. Recharge: Each night, I went home to the apartment I booked through AirBnB to soak in quiet solitude. As an introvert, this is how I stayed balanced and ready for more enriching social connections the next day. Sophie from A Squirrel in the Kitchen (I got to see her twice in one year). I think she has met more people than any other blogger I know in the AIP community. One of the perks of living in Boulder where lots of people travel! Samantha from AIP Sisterhood. She's about to have her first baby and she's also a full-time nanny, so she squeezed this trip in during a very busy time in her life. One lesson we've all learned is to grab opportunities when they come your way, because you don't know when or if they'll ever come again. Angie from Autoimmune Wellness. When I started a healing diet in 2012, hardly anyone was following the paleo autoimmune protocol. Angie, Mickey and I quickly found each other's blogs and have been online friends for 4 years. Jaime from Gutsy By Nature. A frequent business traveler, she jumped on the idea of a blogger retreat and even drove Angie down from DC. Girlfriend road trip! So what did we do on this retreat? 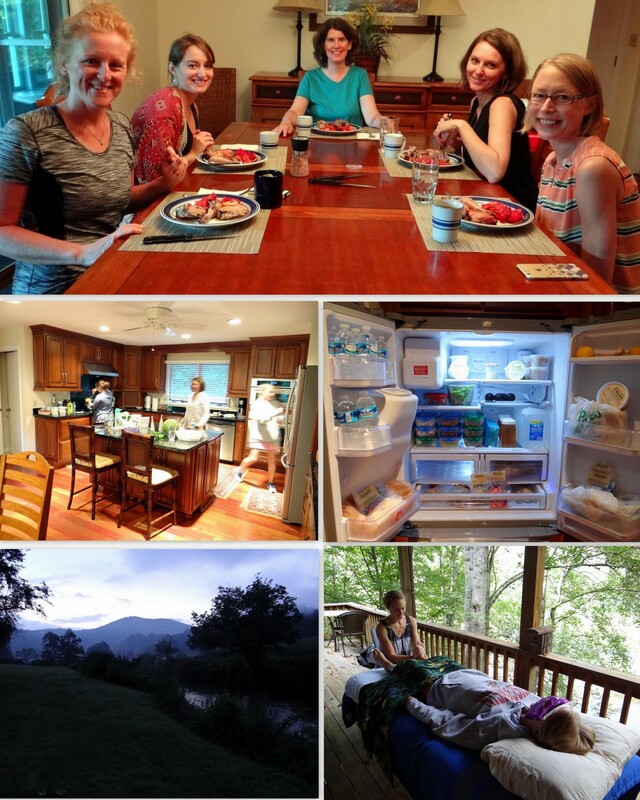 Mostly we ate really delicious and healthy food and talked and laughed our way through three days and nights. I also had my friend Ali come and give everyone a reflexology session on the porch overlooking the river. Because in spite of the name, retreats are kind of intense. You're trying to cram years of catching up into just a few days, and there's travel fatigue to overcome, also. When you have autoimmune disease, you learn the importance of self-care! It's time to say thank you to a company that's a big part of my travel (and hosting) experiences. They are a frozen meal delivery service with a huge AIP-friendly menu, and I first took their meals with me on vacation last year. I don't know what I ever did without them! When I attended PaleoFx, I packed my carry-on cooler with meals for breakfast, so in the morning all I had to do was heat and serve. For the retreat, they donated all of our breakfasts and dinners, so all I had to prepare for my guests was lunch and snacks. If you listen to my podcast, you know that POTG is also my podcast sponsor. 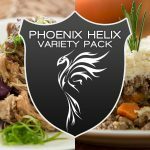 To celebrate my 2-year podcast anniversary, they had me pick some of my favorite menu items and created The Phoenix Helix Variety Pack. It was meant to be a limited time offer, but it's so popular they've made it a regular menu item. 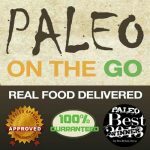 If you've never purchased from Paleo on the Go, use the coupon code PHOENIX for 10% off any order. They sell everything from bone broth to holiday meals to sugar-free bacon and AIP pop-tarts. I can't recommend them highly enough. 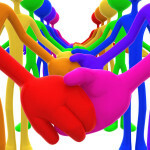 Local Meetup Groups: This is the simplest way to begin. Many cities around the world have local groups where people following the paleo autoimmune protocol have the opportunity to meet. If there's no group for your area, consider starting one. And if your local group is only chatting online, encourage everyone to take it to the next level. Face-to-face meetings are enriching in a way that can't be replaced by technology. Conferences: These are an extrovert's dream, but you can also navigate them as an introvert. It's a way to literally be surrounded by a paleo tribe of over 1,000 people (and you can break that down into 1:1 connections if 1,000 seems overwhelming). At these events, you are not the weirdo; these people “get you”. 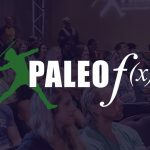 PaleoFx and Ancestral Health Symposium are two that happen annually, and keep your eyes open for a paleo autoimmune conference. Someday, that will happen! Become a host yourself: All of these events started because one person saw the need and made it happen. Start small and organize a local picnic, or go big and organize a retreat or a conference. Not sure where to begin? Ask someone to help. Show Up: Life is busy for all of us, and it's easy to think that opportunities that come once will come many times again. But often, that's not the case. Grab that brass ring! If you have the chance to meet paleo friends in real life, whether that be a potluck supper, a conference or an overnight retreat, write it in pen on your calendar. If you don't, it's human nature to no-show at the last minute, and you'll miss out on a beautiful experience. 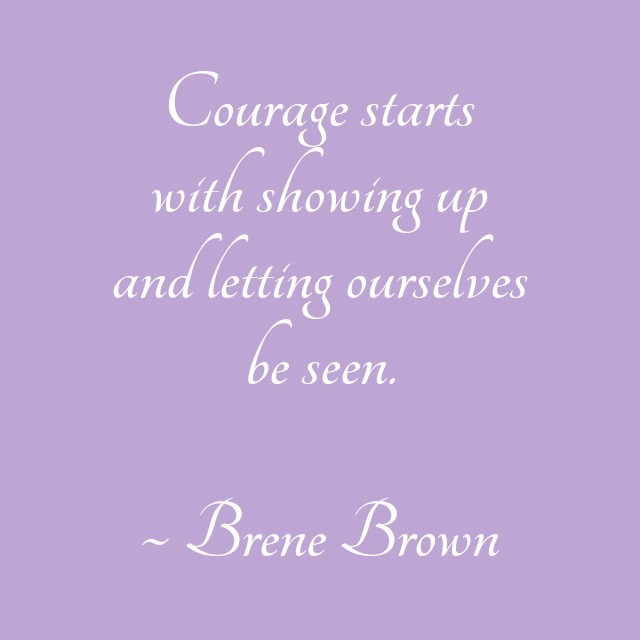 Even if you're tired, these are fellow autoimmune warriors; you don't have to pretend – you can show up as your authentic self. Social connection is a valuable part of a healing lifestyle. Don't underestimate that need. How Do I Get the Support of Family and Friends?